Smith and Nephew Primapore Wound Dressing from HealthyKin.com combine an absorbent pad with a soft and conformable fixative layer for the simple and effective management of sutured wounds. Highly absorbent and low-adherent pad - The wound contact layer enables the passage of blood or exudate into the highly absorbent pad whilst maintaining a good healing environment and minimal pain on dressing removal. Safe and Secure Fixation - The low allergy acrylic adhesive is evenly spread onto the non-woven backing surface providing a safe and secure dressing fixation over the wound site. Soft and Conformable - Ensures patient comfort and conformability to all wound sites (even the more difficult areas like underarm and shoulders). Ease of use - The protector paper, which is slit across the width of the dressing, enables quick application without the risk of touching the absorbent pad or adhesive area with fingers or forceps. The easily opened packaging facilitates aseptic dressing technique. Patient Comfort - The thick pad minimises fluid strike-through and helps to protect the wound from trauma. Indications - Primapore Sterile Adhesive Wound Dressings are ideally suited for post-operative use. They are also useful in Accident & Emergency for cuts, lacerations and sutured wounds. I highly recommend!!! Primapore bandages are incredible products especially for someone like me who is allergic to bandage adhesives. These do not irritate my skin. I will always make sure to keep a supply of several different sizes on hand. 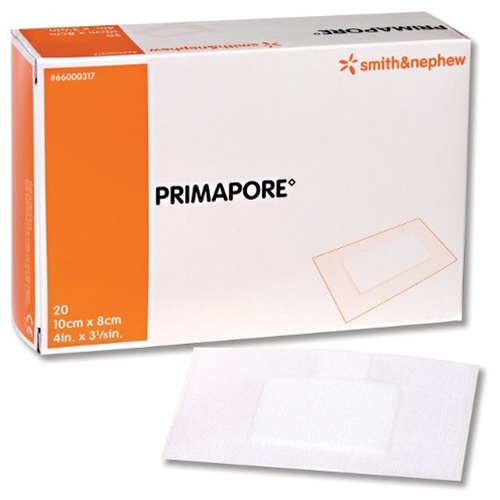 One important thing I learned when ordering Primapore, is to keep in mind that the dimensions listed for each bandage is the overall bandage size, and the pad area that will cover your wound is MUCH smaller than overall bandage dimensions. So remember to order a bit bigger than the pad area you need. Nothing compares to your products. The dressings can get wet and still stay on protecting the wound. Very good product, exactly what was used by hospital staff. these wound dressing assorb more than other bandages will buy more. Excellent product. I am in a wheelchair and I suffer from shearing sometimes as I am on my bottom for hours each day. If I have an opening develop, these bandages protect it from turning into a dangerous pressure sore. And, even without a skin opening, I use these daily to prevent developing one, as they add a bit of padding.